Are you looking for a branded cup for your next community event or music festival? Our promotional Stadium cup is the answer. 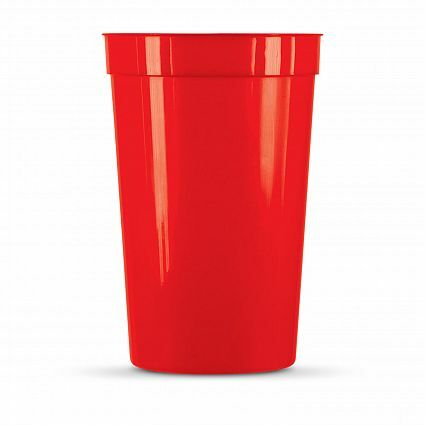 These inexpensive but stylish cups are perfect for your next event or function and with its bright colour range, you’ll certainly have some options to choose from. Made from BPA free polypropylene, the Stadium cup is completely reusable and at 400ml is the perfect size for any event, whether it be a sports, music, food or community event. Our customers have used these cups for a large range of purposes, from recreational events such as sports, leisure and community through to music events and corporate family fun days. Because they are reusable, the save you having to purchase hundreds of plastic throw-away cups or bottled drinks, and in turn, help keep down the rubbish you need to pick up and dispose of at the end of your event. Our Stadium cup is also a great choice when looking for a solid promotional merchandise mug. Being plastic, it is a great addition to your children’s range, and when printed with your attraction’s logo, makes a great souvenir or gift to take home. Whether you run a theme park, or are promoting the latest film at your cinemas, the Stadium cup will look great in any setting. With 10 different colours to choose from, and a large logo print space to show off your brand, if you need an inexpensive, reusable cup for your next event or function, you really can’t go past the Stadium cup.